Product prices and availability are accurate as of 2019-04-18 22:37:31 UTC and are subject to change. Any price and availability information displayed on http://www.amazon.com/ at the time of purchase will apply to the purchase of this product. 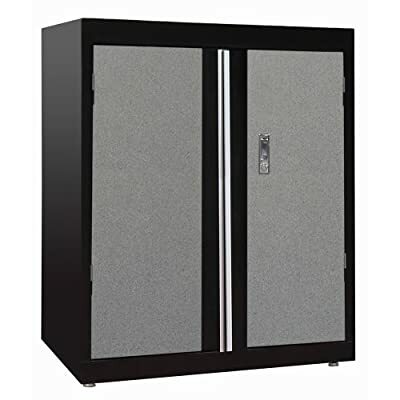 This Sandusky Lee GA2F301836-M9 storage cabinet is made of welded steel for strength and has a two-tone black and gray powder coat finish for resistance to chipping and corrosion, two adjustable shelves, a grommet in the back, two hinged doors with full-length pull handles, and a recessed push-button locking handle. 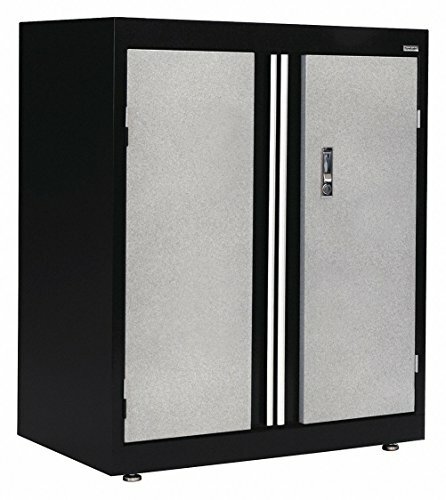 It is suitable for organizing, storing, and securing items. The grommet in back of the cabinet provides a pass-through for power cords or cables (not included). The recessed push-button handle has a latching cam lock for security. Two keys are included. This storage cabinet has four leveling guides for use on uneven surfaces. The bottom surface on this cabinet is raised above the kick plate for ergonomic purposes and can be used as a third shelf. The cabinet measures 36 x 30 x 18 inches (H x W x D). (H is height, the vertical distance from lowest to highest point; W is width, the horizontal distance from left to right; D is depth, the horizontal distance from front to back.) It has been manufactured to comply with American National Standards Institute/Business and Institutional Furniture Manufacturers Association (ANSI/BIFMA) standards for shelves. This cabinet has a 200 lb. per shelf load capacity when the weight is distributed evenly across the shelves. It ships assembled, but some handle and lock assembly are required. Instructions are included, and assembly tools are sold separately.